PVC or vinyl banners are an increasingly popular form of outdoor advertising, thanks to vinyl being such a flexible and portable material. 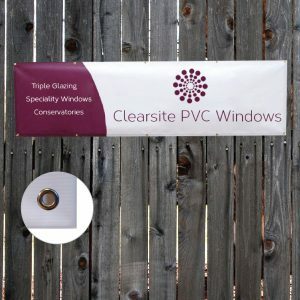 The constant innovation in digital printing techniques and development of higher-quality yet affordable banner materials and inks, means that more and more companies are using PVC banners for branding, promotions, sales and events. Common uses include street banners, exhibition and trade show banners, festival banners, school banners, table banners, building banners and sports stadium banners. Design a Sign produce premium-quality vinyl PVC banners to suite any business, commercial or personal banner needs. We only use the highest quality, premium materials and inks to ensure that the product you order from us is of an excellence standard. At the same time, we do not compromise on price and check all of our prices against our competitors on a daily basis. We are even are happy to offer you a refund if you find the same PVC banner anywhere else for a cheaper price. Please visit our Terms & Conditions page for full details. All of our PVC banners are printed onto 440gsm tear-proof vinyl using weatherproof, UV-fading resistant eco solvent inks, which means that they are made to last and suitable for both indoor or outdoor use. The weight of the vinyl ensures the ideal balance between being strong enough for durability without making the product too heavy. We always use eco solvent inks on our banners because they do not contain harmful ingredients, are biodegradable and have very little or no odour. With prices starting at just £14.16 for a 3.9ft x 2ft banner, our PVC banners are both affordable and flexible. While we have a number of fixed-price sizes available to order through our website, we are always happy to provide custom-sized banners if one of the options on the product page does not match your requirements. 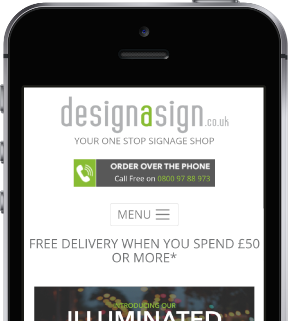 Please contact our production team via info@designasign.co.uk to discuss custom sizes or any other enquiries. 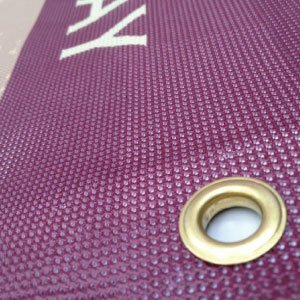 Our PVC banners are available with either stainless steel eyelets and banner ties or pole channels, depending on your preference, at no extra cost. If you have your design already prepared, simply upload your existing artwork straight to basket. To design your own PVC banner from scratch, our easy to use online design software is very popular amongst our customers. We’ve even included a handy how-to video on each product page and our design team is always on hand to answer your design questions. We have also provided hundreds of banner templates based on the most popular request we receive. To use one of our existing templates, go to the page of the product you’d like to order and scroll down to the list of templates at the bottom of the page. Select your favourite, add your personalised text, logo and images, then place your order, sit back and wait for delivery. Customers are also able to take advantage of our free design service by sending us a design brief after you place your PVC banner order. Select your preferred option on the product page and order. Don’t worry if you forget to send your design brief through to us, we’ll be in touch if we don’t hear from you after 24 hours.